Send a little holiday magic over to your sister and her family with this sensational Merry Christmas card! It will remind them that the holiday season should be filled with joy and magical moments. This holiday card showcases an outstanding winter scene with Santa and his reindeer setting down near a house. Your sister and her family will truly appreciate that you sent such a wonderful Christmas card. Send Santa on his way to bring a little Christmas magic to your family today. 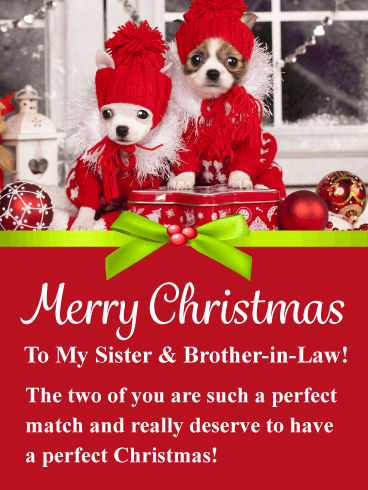 This Christmas card is absolutely adorable and your sister and brother-in-law are going to love it! These puppies are dressed up in their Christmas best and will steal the hearts of your Sister and her husband! They sit among festive holiday ornaments and are framed with a bright green Christmas bow! The message expresses that you think they are a perfect match and that they deserve a perfect Christmas. It really doesn't get any better than this! 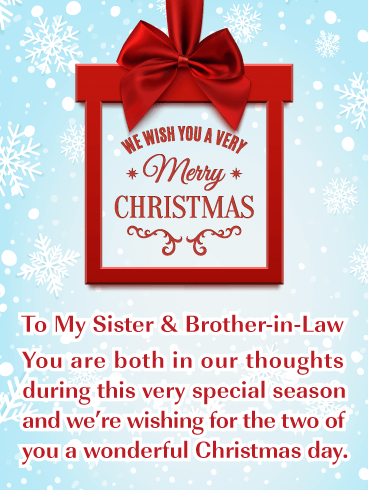 Send a Christmas card to your sister and brother-in-law that will make them feel special! This endearing holiday card lets both of them know that they are on your mind and that you wish them a wonderful Christmas day. It will mean a lot to them! This delightful holiday card has spectacular snowflakes against a blue background and a creative sign that wishes them a Merry Christmas. 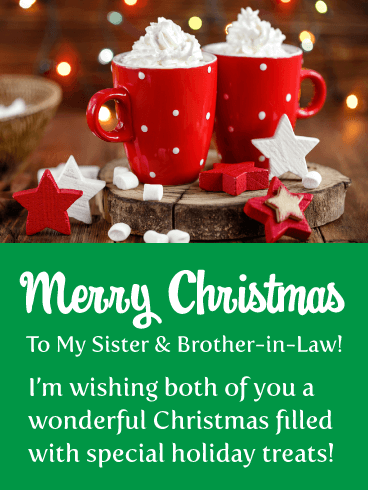 Let your sister and her husband know how much you care, send this fantastic Christmas card out today! 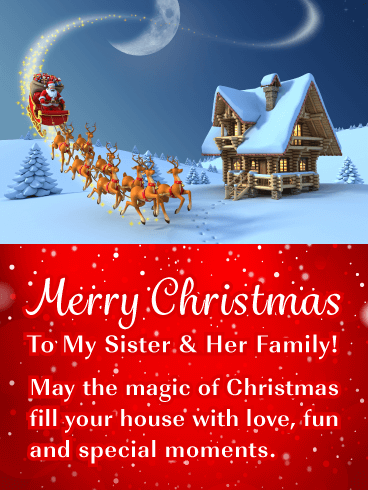 Put your sister and her family in a cheerful mood with this charming Christmas card! 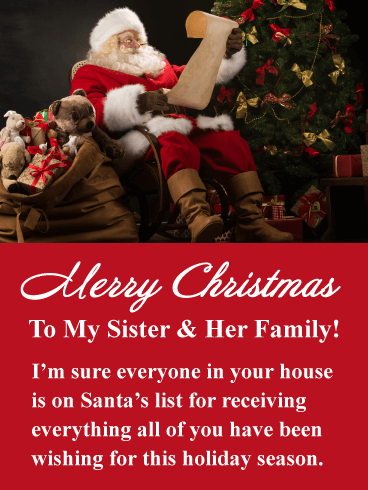 It displays a lovely image of Santa reviewing his list, and you are hoping that your sister and her family are on it! They will both get a little laugh out of it. The image also features a delightful Christmas tree and Santa's sack of presents. Be sure to send this wonderful holiday card out soon so they will receive it in time for Christmas day.